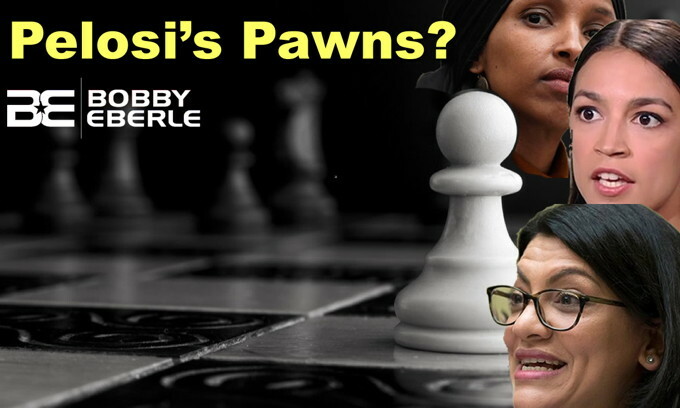 Omar, Tlaib, Ocasio-Cortez: Pawns of Pelosi? Are conservatives allowed on campus any more? Oh the headaches! Nancy Pelosi’s head must be about to explode. As she works to try to keep her Democrats in line, freshmen such as Ilhan Omar, Rashida Tlaib, and Alexandria Ocasio-Cortez just keep on doing what they are doing. This weekend was no different as these young socialists actually attacked the Democrat leadership for using them as pawns! Also, are conservatives even allowed on college campuses any more? We’ll take a look at some of the latest attacks from the left. All that and more. With friends like these, who needs enemies? That’s what Nancy Pelosi must feel like when dealing with the new Democrat freshmen. These millennials are so far to the left and have no desire to listen to authority or “wait their turn.” This weekend, Pelosi talked to “60 Minutes” about the new Democrats. She will also have a new set of headaches as Rashida Tlaib said the Democratic leadership is using people like her and Omar and Ocasio-Cortez as “tokens” or pawns. Also, the environment just keeps getting worse for conservatives on college campuses. There doesn’t seem to be any room for ANY opinion that comes from the right. The only “free speech” that’s allowed is leftwing speech. Check out today’s show for all the details. Pawns? LOL. More like lose cannons. Very lose cannons. They shoot their mouths off and the cannon goes clear over to the other side. Lookout! Hey Nancy……are you still applauding your newly elected troublemakers? I agree. IF they are pawns, its of Soros and his ilk..
>are conservatives even allowed on college campuses any more? I graduated college in the late 1980s. Even back then there seemed to be a de facto “don’t ask, don’t tell” policy concerning conservatives. And one is subject to being ostracized if discovered to be a conservative, at least in the non STEM community. What a repulsive group these dems are now running for president. Ditto for Omar and her ilk in Congress. All pelosi and company want is ‘plausible deniability,’ just enough to say that the mainstream socialists can distance themselves from the puppets. They are using these little twits to say what the leadership actually thinks but are smart enough to know they must first have the people numb to it before they move it quietly to the mainstream. The leadership is keeping a close count on every single blurb these little fools bring forward, just to see what flies and what does not. This is the true face of the socialist/democrat party. No matter what, they will ALWAYS deny, deny and lie..
Expel from the US House of Representatives and then deport Islamist fanatic Democrat Rep. Omar (D-MN) back to Somalia ASAP! Defeat Palestinian sympathizer Rep. Tlaib (D-MI), empty bag Rep. AOC (D-NY) and senile House Speaker Pelosi (D-CA) in 2020 and deport them all back to Michigan, NY and California, respectively! Why not send Tlaib to palestine?? You reap what you sow Nancy, this IS the Treasonous Dem Party. My oldest son went to Ohio State University and vehemently complained during his time there that his conservative views were summarily dismissed or not welcome to be discussed or espoused. This political environment that demands equality and equal treatment is a farce. They only want the leftist doctrines protected and label the right or central conservativism as racists and hate mongers, while they loudly protest, demean and dismiss that viewpoint, at times with violence! We are in a country where one party hates Trump and the loss to him in the last election so much, they are rapidly and blindly producing the environment they so desperately claim to despise. Segregation and racism at its most blatant level! Which is why once i moved up to columbus, i quickly removed OSU as a possibility for me to spend my GI bill at..